I decided to recreate Elizabeth’s Layered Taco Salad as a Chopped & Layered Taco Salad. And I wanted to make it pretty by serving it in a trifle bowl. I also wanted to turn it into a healthy taco salad by using wholesome ingredients I use in recipes like my Easy & Healthy Taco Soup and Best Slow Cooker Spicy Pulled Pork Tacos such as beans, corn, low fat shredded cheese, diced red onions, salsa, and homemade Greek yogurt guacamole. This healthy taco salad recipe turned into such a hit with my kids that I make it at least once a month – and we rarely have leftovers. It’s a shame, because I think Chopped & Layered Taco Salad tastes even better the second day. 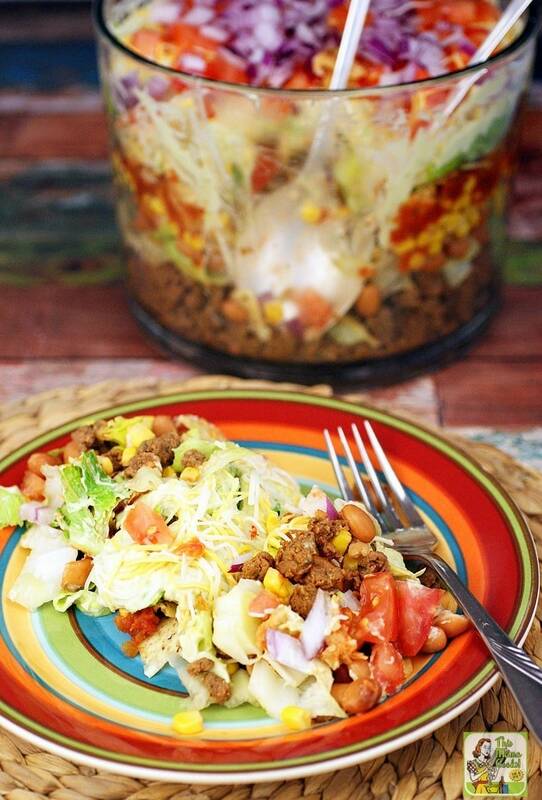 How to make Chopped & Layered Taco Salad even easier! Along with canned beans and corn, I use 1 pound of ground beef or ground turkey. While you’re browning the meat over medium high heat, add your favorite taco seasoning, and 1/2 to 3/4 cup of water. I use 3 tablespoons of my Homemade Taco Seasoning. Just remember to let the taco meat cool before using it in this layered taco salad recipe so you don’t wilt the lettuce. Also, this easy taco salad recipe is a a great way to use up some of those broken up tortilla chips you’re left with at the bottom of a bag. You’ll want to keep your broken tortilla chips in a ziplock bag in the freezer so they don’t get stale and yucky. It’s time to dust off your trifle bowl and use it for something other than whipped cream, berries, and cake during the holidays! 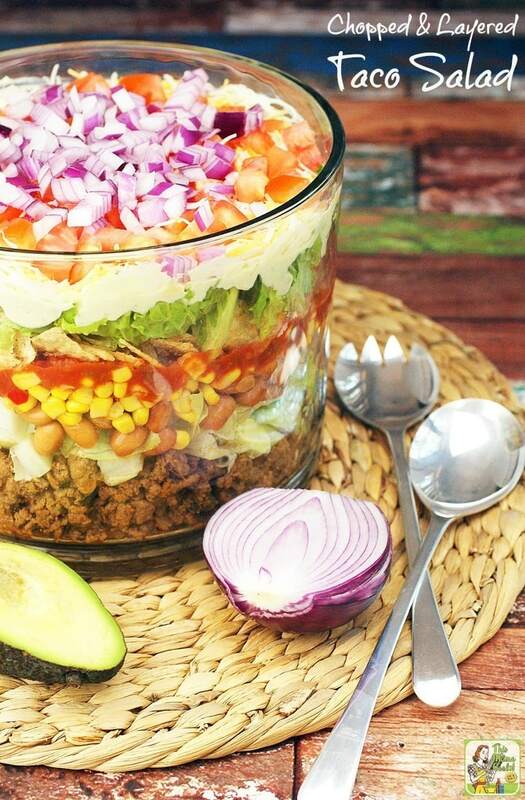 This healthy taco salad recipe looks best when layered in a trifle bowl or a punch bowl. 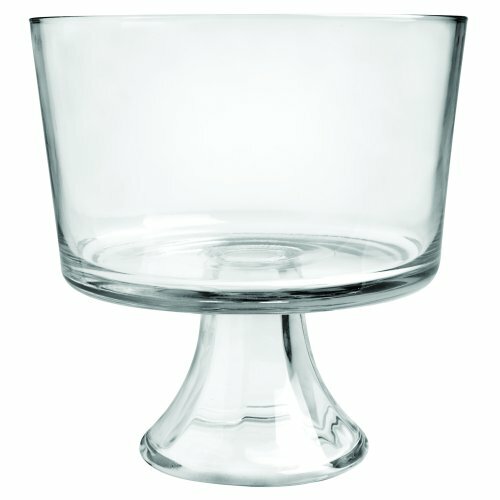 However, any large bowl with high sides, like a mixing bowl, is good in a pinch, too! This easy taco salad recipe is easy to double, so it’s ideal to feed a party crowd. If you’re taking it to a potluck, make it in a large lasagna pan with a lid and carry it to the party in a Rachael Ray Lasagna Lugger. 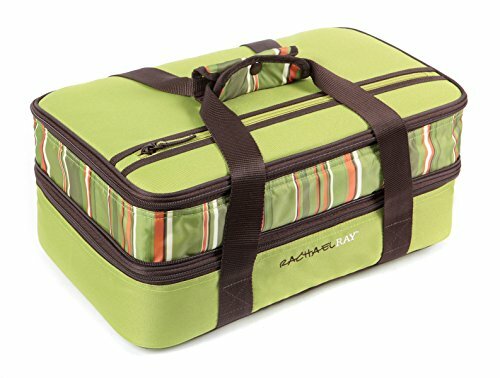 I love this bag since it keeps your easy taco salad cold and tidy. If anything spills, it’s kept inside the bag – and not all over your car. The straps make it easy to carry and it’s super cute, too! 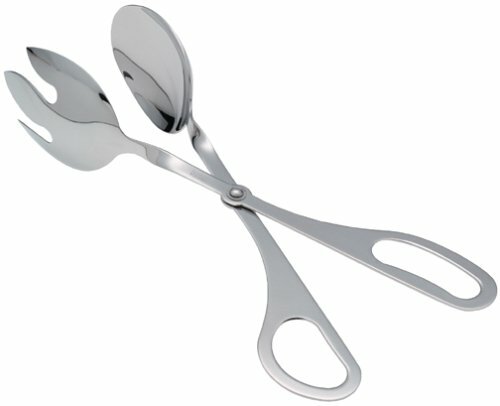 Don’t forget those salad tongs, too! Nothing worse than asking your hostess for a serving spoon and all she has is a plastic fork! I love these because they can grab big portions of this yummy layered taco salad. To make the guacamole, cut the avocado in half. Remove the pit and scoop out the flesh with a spoon into a small bowl. Add the Greek yogurt, lime juice, salt, and hot sauce (to taste). Mash with a fork to break up avocado and stir until ingredients are combined. 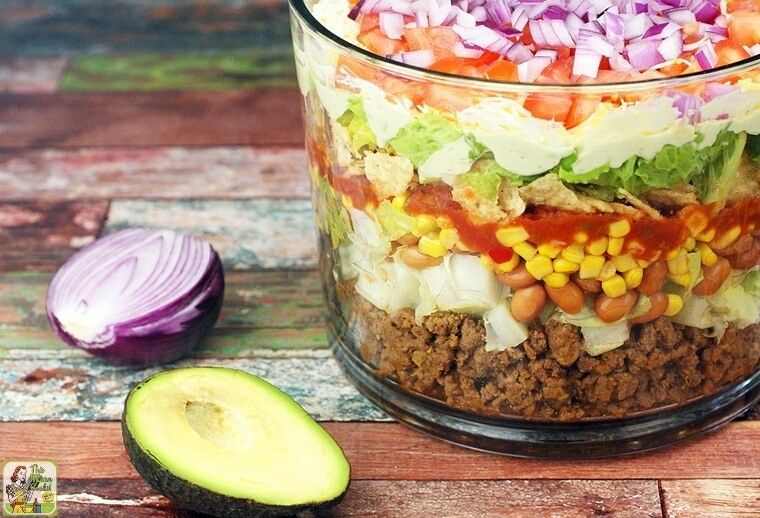 Assemble the taco salad in a glass trifle bowl in the following order. The beef crumbles go at the bottom. Follow with half the Romaine lettuce. Then add the pinto beans, corn, salsa, tortilla chips, and remaining Romaine lettuce. Finally, add the guacamole, shredded cheese, chopped tomato, and diced red onion. Originally published on August 12, 2015. Updated with new pictures and information. I made this salad tonight for dinner, love it, and will make it again. Very good recipe for a hot, in the 90’s. night. thanks for the recipe.